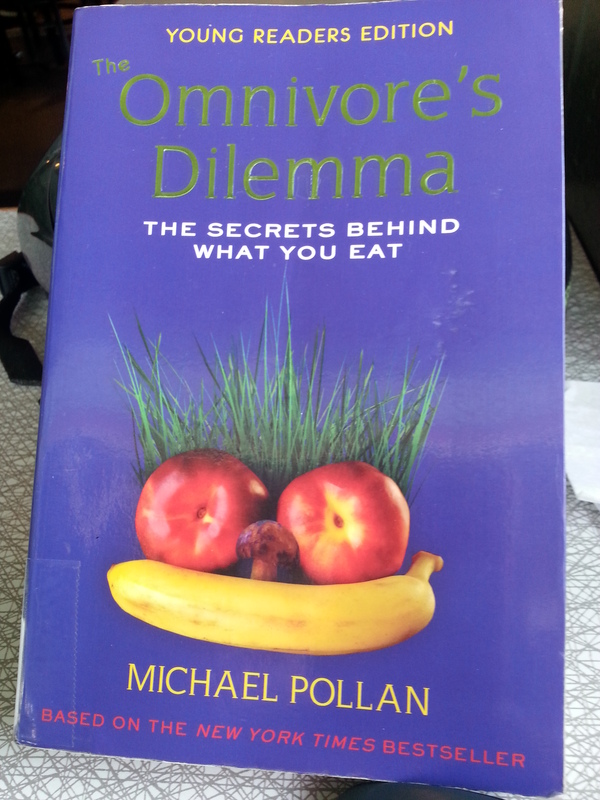 If the book “The Omnivore’s Dilemma” by Michael Pollan had come up while the Kalamazoo Business Book Club in person meetup still existed, I definitely would have approved it as a choice. Where I ended up learning about it was at a (Kalamazoo) Startup Grind event in May. The guest, Erika Block, founder of Local Orbit, stated that the reason she finally received funding was because an investor had read a couple of Pollan’s books and it changed how he thought about food and eating. After reading “The Omnivore’s Dilemma,” I can see why! I’m not sure what the difference in content is, since I happened to checkout the “young reader’s” edition. Pollan did a good job of narrating his journey and answering all of the types of questions there might be. In fact, he stated near the end that because of the book some vegetarians went back to eating meat, while others became vegetarians. The definition of the “omnivore’s dilemma” given in the book was that we (humans) have access to a wide variety of food without knowing what is best for us. The experience has also changed where many were farmers and now there are only a few. In addition to this change, we have lost much of the knowledge of what is safe to eat from the land, contributing even more to the dilemma. Have you ever wondered why corn exists in so many items, even when it is not a food item? Pollan started with the history of corn and how it became “King.” I can’t say that I have changed anything in my diet yet. It has definitely encouraged my thinking that I am on the right path and need to look more closely at the ingredients of what I do eat, and where it comes from and find ways to eat healthier overall with “real” food. Another of Pollan’s points was about what is considered “organic.” According to the book, there is “industrial organic,” as one form of organic. In the case of the industrial version, the farms are created to have mass production. Because everything is geared towards mass production, the crops are limited (corn, at the least), and the animals are fed and treated for fast growth. The farms in these cases accomplish what they want and can ship to anywhere. The farmers are always successful, too, because if the crops aren’t selling as well, then they receive government subsidies. On the other side is the local sustainable meal which primarily comes from grass farms. Pollan wrote about his experience working at a grass farm for a week. The idea to do that was inspired by the fact that the farmer would not ship anything and told Pollan he would have to visit if he wanted to buy any of the food. Pollan’s work as a farm hand included being a part of the assembly line when it was chicken killing day. What freaked out Pollan the most was how fast killing chickens became “work.” The interesting part of the process was that it was all in the open so anyone who was going to purchase a chicken could see exactly the method being used. While at the farm, visitors could also see how the farm was run. According to the farmer, a grass farm helps create a natural ecosystem where each animal and plant has a part, all the way to the table. The grass farmer feeds the local community and does not ship far away. These farmers don’t receive the same subsidies as the industrial farmer since they grow and raise a variety of crops and animals. What they are able to do is feed themselves almost completely from the land, which I personally think is awesome. The final part Pollan talks about is the hunter and gatherer. Pollan finds others who help him learn to hunt a wild boar and to gather mushrooms. After his experience hunting, Pollan decided to step back and be a vegetarian for a short while in order to check himself on the idea of eating meat. After reading all of the experiences, I was thinking, “Ok, now what?” Pollan anticipated that and has sections with resources and ideas for how to handle the food dilemma. I appreciate the resources and afterword most of all and hope to follow up on some, such as buying more from the local farmer’s market or learning to grow some food myself. If you haven’t read “The Omnivore’s Dilemma,” I highly recommend it. If you have already read it, what was the one point that you remember most?